Here is what you can expect to find inside the Spring 2017 issue of SewStylish. 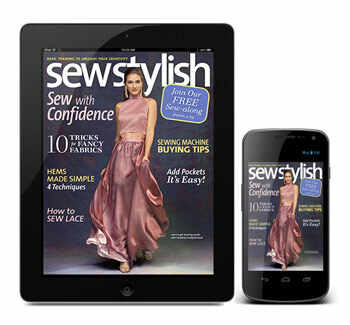 Download the Threads magazine app and read SewStylish on your IOS or Android device. Learn an expert’s five top sewing machine features to look for if you are new to sewing. Get to know types of lace you can use for the gorgeous overlays featured in the new SewStylish pattern, and learn handy tips for sewing this romantic, feminine textile. Discover the latest notions and new fiber arts books in our Cool Tools and Bookshelf departments. Meet successful independent pattern designer Sarai Mitnick of Colette Patterns in our Designer Insider. See how to draft and sew in-seam pockets to add this handy feature to nearly any skirt or pant design. Create and add custom monograms, patches, beadwork, and more to your ready-to-wear or sewn clothes and accessories. Learn a professional costume designer’s tips and tricks for hemming long or short skirts. Learn how and why top designers work in muslin as they design garments. We’ll show you how to sew a muslin, or test garment, and troubleshoot the design first, so you’ll always achieve great results with your projects. A PDF download of SewStylish can be purchased in our store. Download and read SewStylish on your IOS and Android devices. For this option, you’ll need to download the free Threads magazine app.